Shoreditch just welcomed a new Scandinavian smokehouse among its growing food scene. Filled with jars of pickles and Scandi vibes galore, this place is like an instagramers’ heaven. Whilst I’ve not been to Barnyard it seems there are instant similarities to the style of the two as consultant chef, Matt Young, previously worked there. But anyways, we were here for the soft launch so bring on the food! 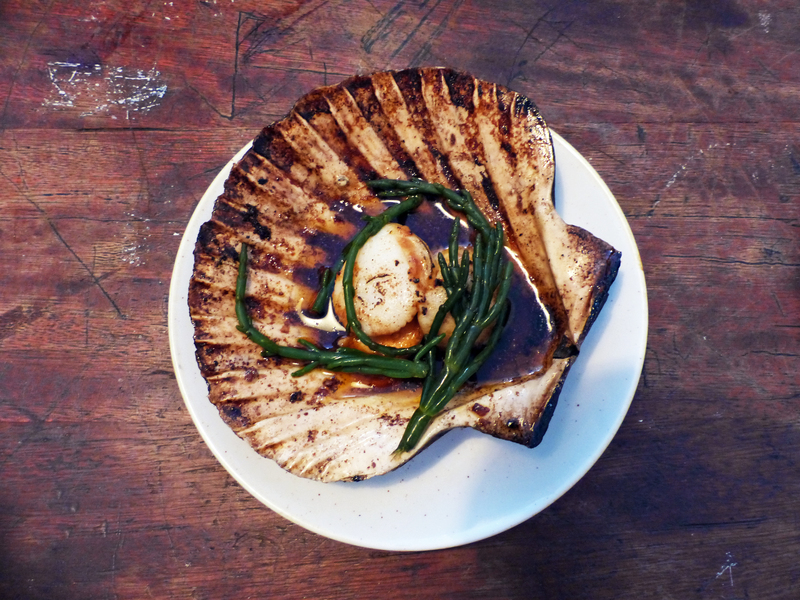 The Scallop in the Shell with Nduja was incredibly tender and succulent with a beautiful smoky taste. The meat was cooked to perfection however I think the Nduja might be a slight overkill to the delicate flavours with the sprig of samphire virtually non existent. Saying that, these are a must order! 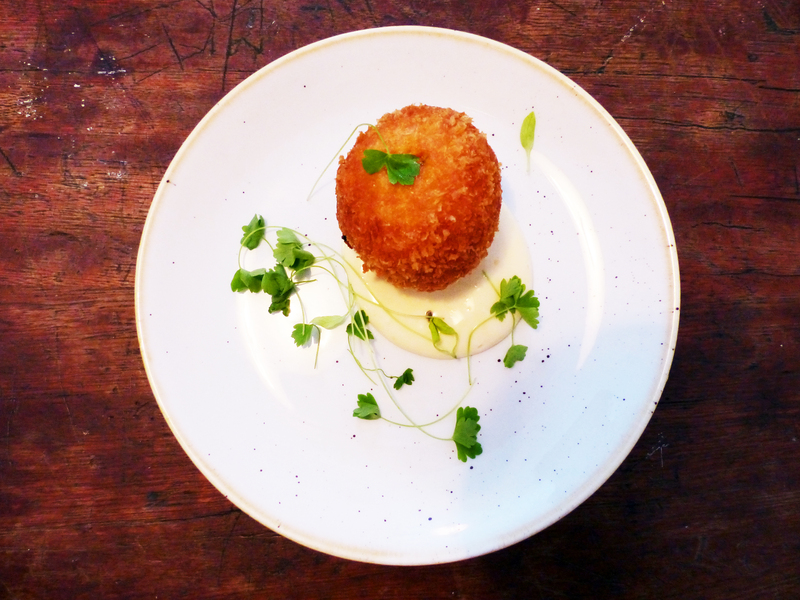 The most daintily presented “scotch egg” I have ever seen. It had a chewy quail’s egg in the centre wrapped in Nduja, one of many to feature this in our meal, giving it a meatier texture. The dijon mayonnaise was good as a sauce but didn’t stand out. 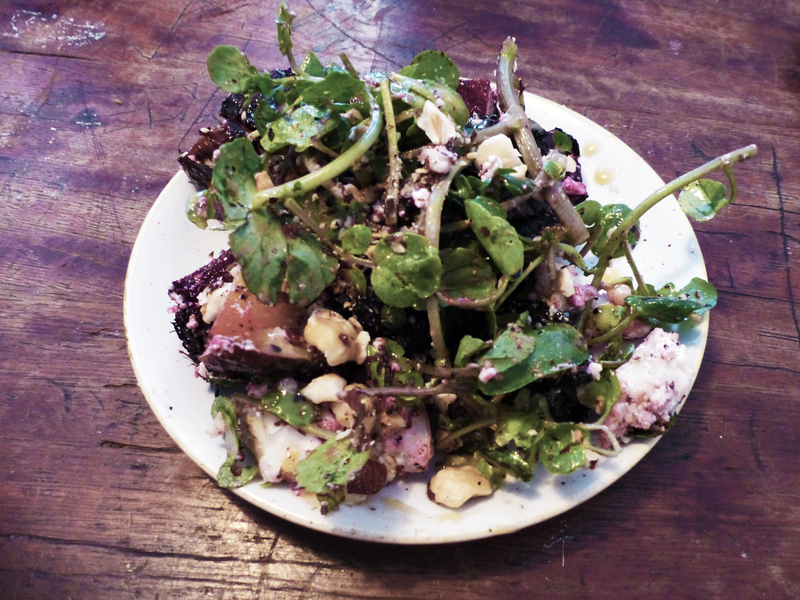 The Charcoal Beet Salad was a nice side to accompany the meatier and more flavoursome mains but didn’t have much intrigue past the first few bites. Everything works well individually but wasn’t really convincing as a whole. As well, I did find some of the beetroot pieces a bit too charred for my liking. 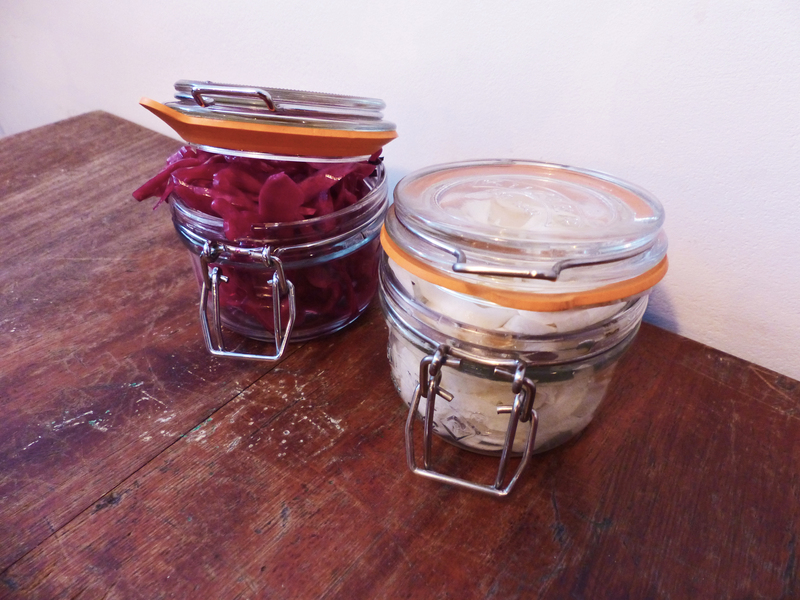 Rök’s homemade Red Cabbage and Fennel pickles were lightly flavoured to help cut through the meatier mains and for those that aren’t a big fan of pickles, this worked out quite well for us. 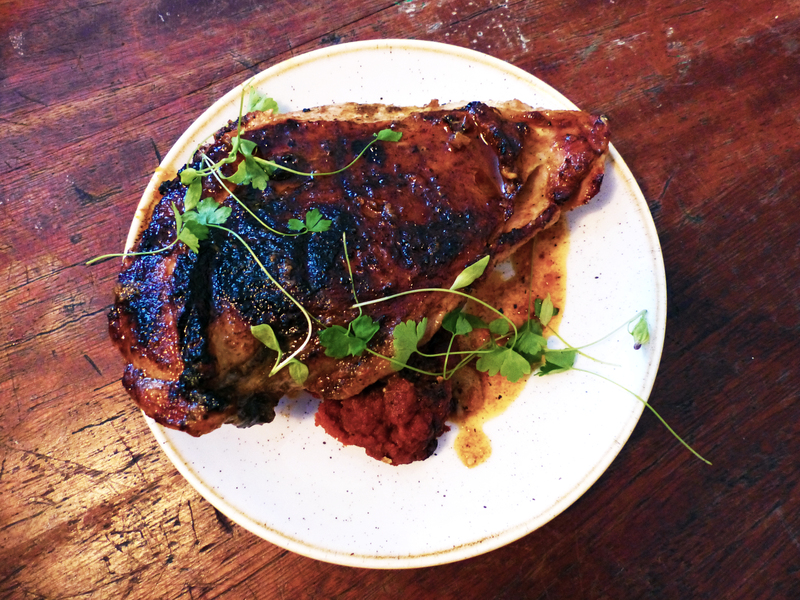 Our favourite dish, the guinea fowl with Nduja (yes another dish with Nduja – gosh for a Scandinavian inspired restaurant they sure do like their Italian ingredients), was a delight to cut into with its juices trickling through the succulent meat. They managed, for the most part, to execute a nice charred exterior without compromising the moisture within. The Nduja on the side provided a smoky compliment to the gamey flavours. The Pork Belly with Roasted Granny Smith was sadly a disappointment. Whilst the meat flaked off and the crackling just about crisp enough it was a tad dry. With no sauce this rendered the whole experience fairly chewy. Flavours were classic, pared with a roasted apple, and worked well but overall execution wasn’t spot on. 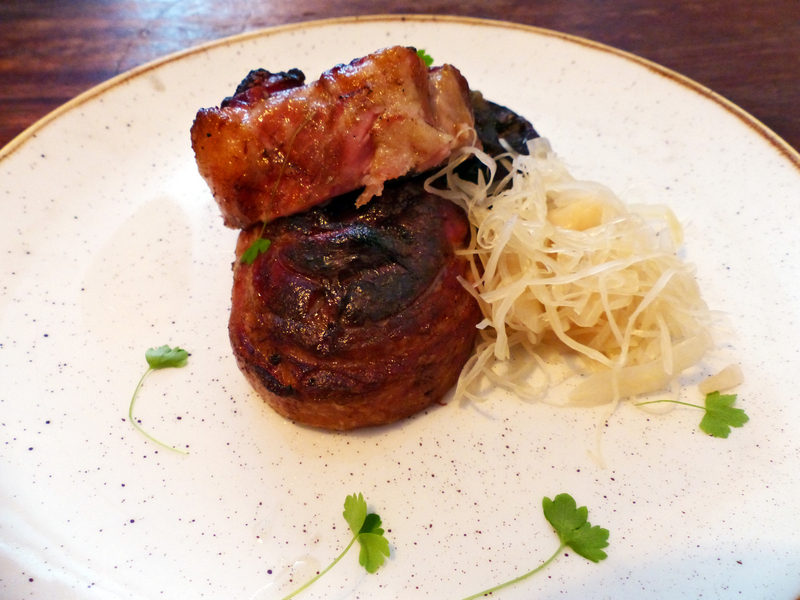 I wish I didn’t succumb to my infatuation with pork belly and ordered the duck instead! 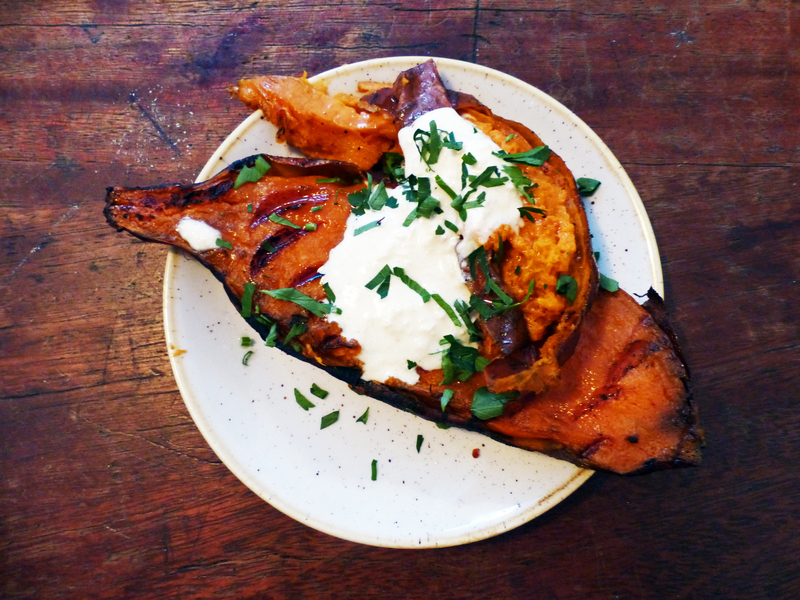 Moreish burnt sweet potato. The creme fraiche adds even more richness to this rather sweet dish but the horseradish flavours were none existent. The only other time I’ve had Bone Marrow Mash was at Pitt Cue Co (review coming shortly), sadly Rök’s doesn’t work as well. 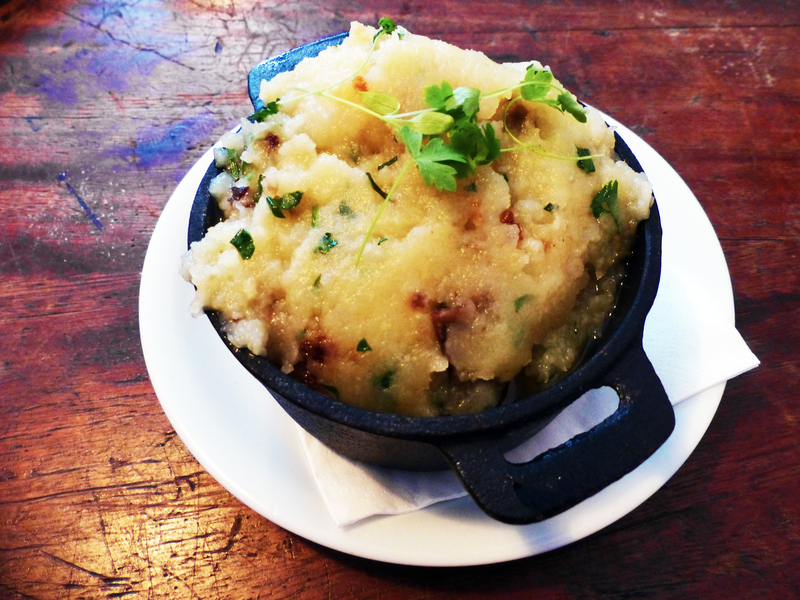 Rök’s version was more obviously infused with bone marrow however the result was an oily and indulgent mash. You could definitely feel the bone marrow infusion but it would have worked better if the flavours were more pronounced rather than the oil. However it’s still perfectly slurpable! 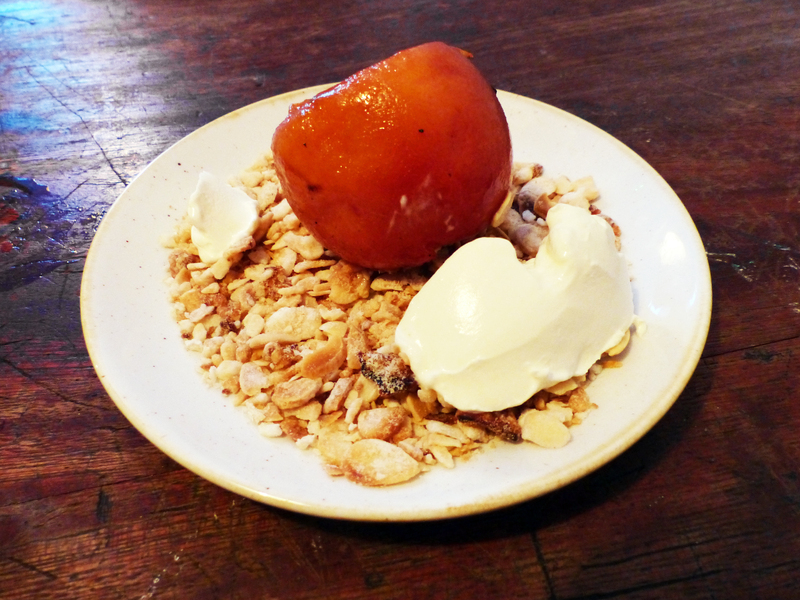 The Wood Roasted Peach was a nice sweet closer to the meal. It was one of the dishes where everything worked well in combination. The slight hint of Laphroaig whisky gave the starting kick, pared with the sweetness of the honey and peach, the creaminess of the creme fraiche with the mixture of textures from the almonds and fleshy peach just spells a good dessert on all levels. Our waitress was incredibly friendly and helpful and most dishes were served with an informative little blurb from the waiter. The interior design is suitably Nordic with a penchant for distressed timber and kilner jars making for instagram friendly photos! Price wise Rök can be a little on the steep side but can be comfortably reigned in if you watch what you order, unlike us! Overall Rök is a welcome addition to the Shoreditch food scene. Food, on the whole, was tasty with similar flavours popping up throughout the menu. Go for their beautifully cooked barbecued meats not normally seen around London.